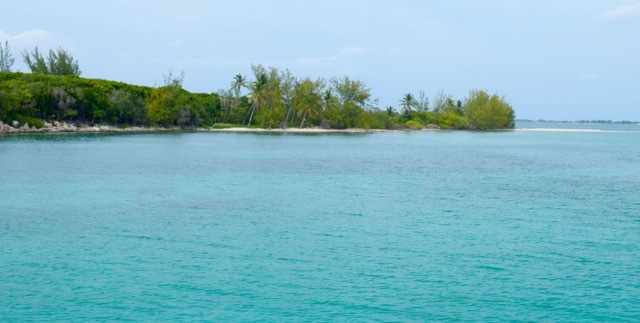 We’ve been enjoying the last couple of days at another of our favorite places…Green Cay. It is only a short 5 nm from Nassau but feels like it’s much farther away. 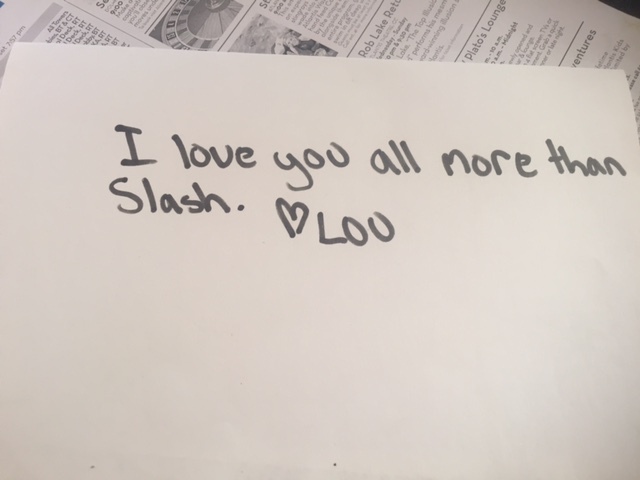 We wanted to stay close since we will be picking Jude and Emma up from the Guns and Roses concert tomorrow afternoon. 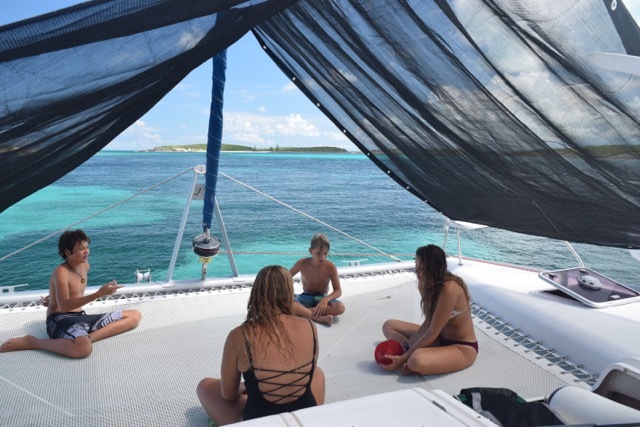 This is one of our favorite islands because the island has a beautiful beach, lots of shells, gorgeous reefs to dive, an assortment of lobster, turtles and sharks to swim with, and fun places to jump off of on the other side. Yesterday Danny, Chad and I went grocery shopping down below and returned with a mesh bag full of lobster. We had a feast! While we were out hunting, I carried the bag with the fish and lobster in it, and at one point after surfacing for air after diving down to look for lobster, i looked to the side of me at the water, and saw a shark fin coming for me. It could obviously smell everything in the bag I was carrying, and I was not about to give it up. I dove back down to face my attacker, and it had vanished from infant of me, but I felt a bump against the bag slung over my back. I quickly turned and smacked the shark in the face with the bag, and called to Chad who was not too far away, telling him that a very rude shark wanted our dinner. 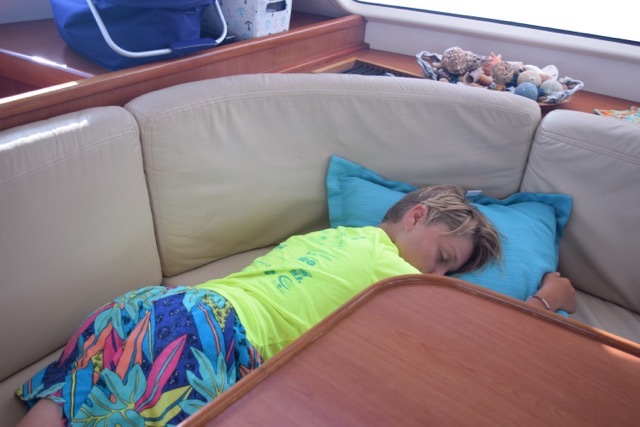 He saw it as well, and the Danny surfaced saying he had seen a young bull shark. For the rest of the two hours of diving and filling our bag, we saw a couple more sharks wanting a free meal, as well as many curious fish. We had so much fun. Today Danny and Chad installed the new windlass, and she’s such a beauty. They are a good team, and will no doubt, work on many more projects on the boat together. I also showed her what live sea biscuits look like, as well as christmas tree worms and feather duster worms. 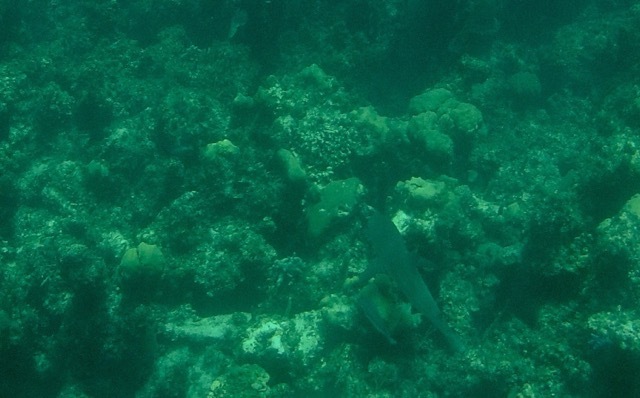 We even dove with a shark, which is tough to see in this photo. We loved our time, drifting along without a care in the world. Back at the boat, the creatures were having a blast as usual. Sierra and Mycah went for a lazy drift along on the paddle boards. This evening we went for another hunting trip and returned at sunset with a couple more for the freezer. My life continues to be filled with so much beauty and learning. I am so grateful for all that I am so abundantly blessed with and hope to one day be worthy of it all. 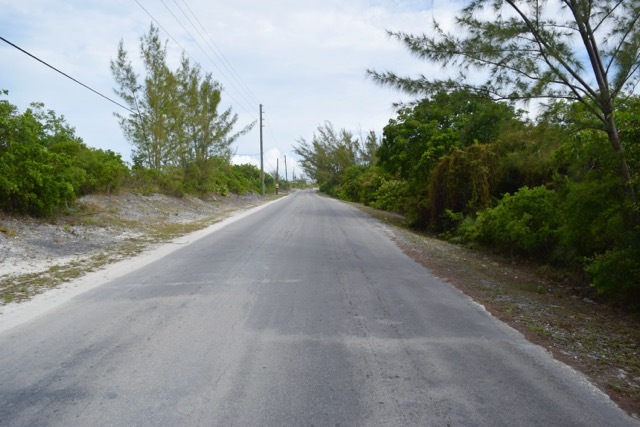 Our journey into Nassau from Rose Island was a short but relaxing. We worked our way south along the edge of Nassau then turned east into the waterway and passed all the big cruise ships. Danny would be landing at 5:30pm and we figured we’d pass time by playing around in the Atlantis Water Park. 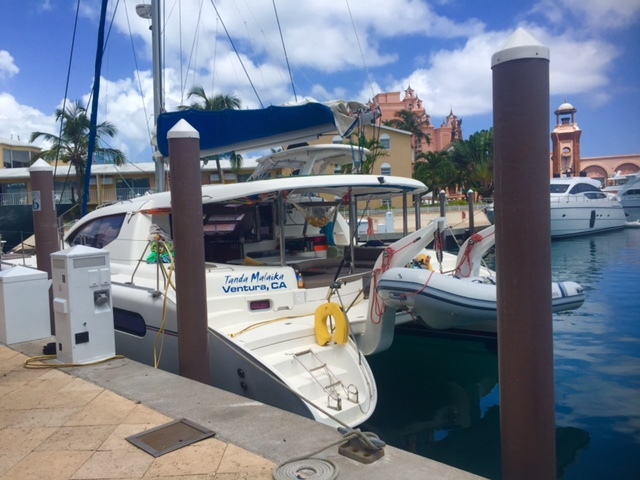 The canal into the marina is lined with restraints, condos and the marina village stores, and the slips contain multi million dollar super yachts. Tanda Malaika was the only sailboat I saw and we felt so tiny compared to what we were surrounded by. I wished Danny was with me to help me dock, but all went well and I was able to dock our big girl without any trouble at all. 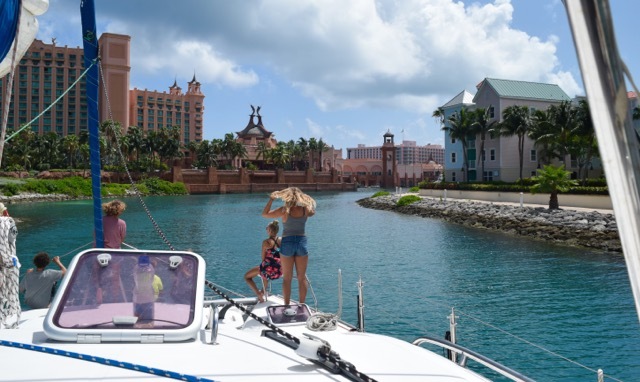 We quickly washed her down, removing all the salt from our crossings, and headed out to cool off at Atlantis. With 5 cruise ships in port, it was pretty crowded, but that didn’t stop us from having a blast and a half. Our first water slide was the one you fly down and into a tunnel through a tank full of sharks. 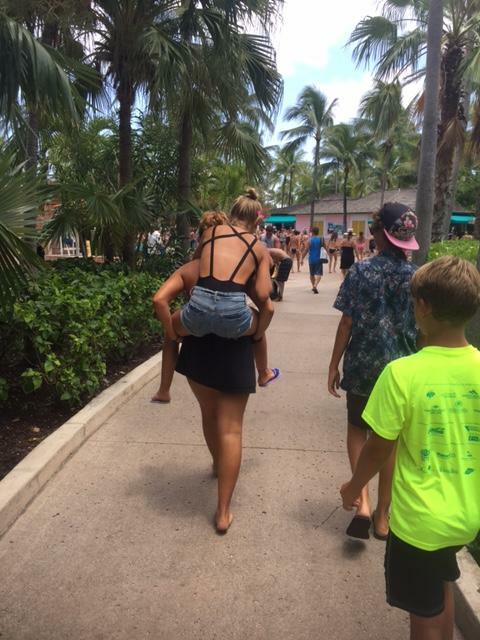 Since Sierra has a hurt foot, her ‘sisters’ carried her around at times. That’s love! Finally at about 5pm I walked back to the boat to change and wait for my Sweethearts arrival. I was SO excited! I was walking the dock to wait at the marina office for him and saw him at the end of it and ran and jumped in his arms. Anyone watching would have been educated in what a long loving kiss looks like. After Danny showered and rested for a bit we met the creatures and the Nell’s in the village to eat out for the first time in quite a while. The creatures were also so excited to see their dad. A parade from the annual Junkanoo Festival came marching by with music blaring and costumes flaring. It was quite a sight. When we were all back on board Danny unveiled something very beautiful…our new windlass. 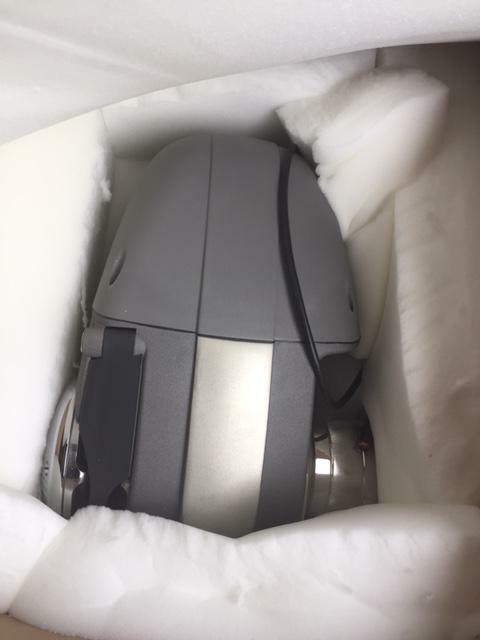 We are so excited to install it. Everyone has worked so hard to raise and lower the anchor and have been great sports. For those that know Emma, you know that she is a huge Guns and Roses fan. She recently found out about a concert in Orlando, which is a 45 minute flight from here, and begged if she could go. She spent every cent of her entire life savings for her concert ticket and airplane ticket. 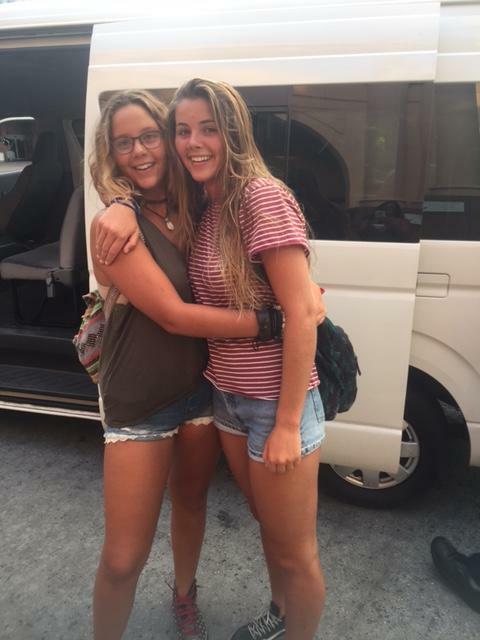 This morning the taxi came and picked her and Jude up to take them to the airport and they will be back in two days. We already miss them tons, but are so excited that Emma gets to cross one more item off her bucket list. 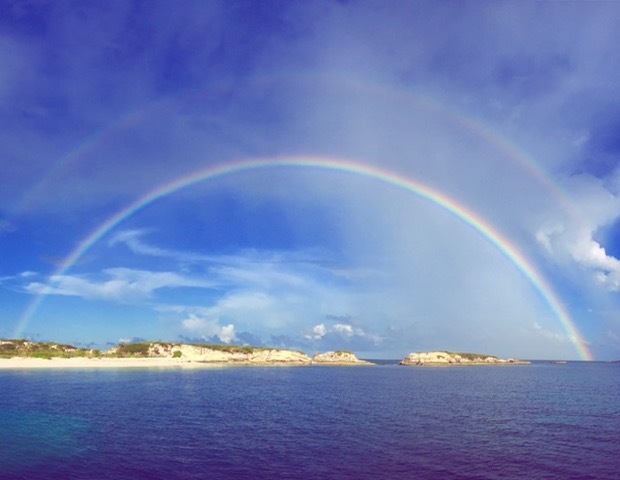 We enjoyed a wonderful time at Hoffman’s Cay yesterday with our friends from Bimini. They arrived in the morning, and after getting settled we took them to the blue hole. All 10 of them loaded into their dinghy which was an interesting sight for us to behold, because we could finally see what we usually look like! It’s loaded, but tons of fun! That endless calypso color of the water never ceases to amaze me. Everyone thoroughly enjoyed the blue hole. Some jumped right away, some gained the courage a little later, some did flips and gainers, and we all had a wonderful relaxing time. We even had a little synchronized swim session! In the early evening we gathered on Tanda Malaika and they treated us to some delicious beans and rice. Afterward we explored White Cay for a short while as the sun began to set, and some of the creatures prepared some wood for a fire to roast marshmallows. The scene overlooking the little bay was so beautiful. 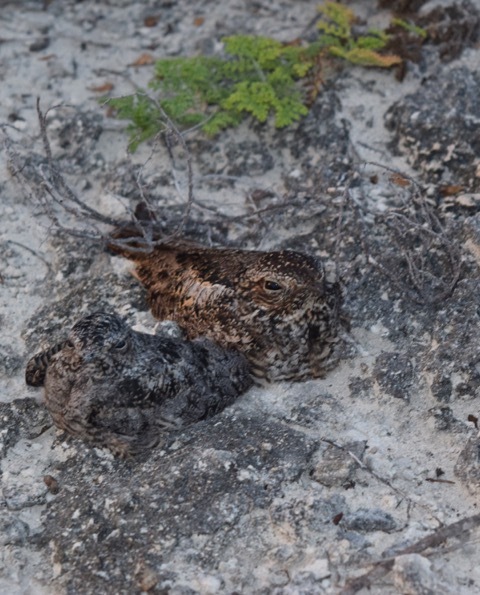 We came across some beautiful camouflaged little birds who sat so quietly on the rocks. Everyone roasted marshmallows and used oreos and chocolate chip cookies in place of graham crackers. We relaxed and chatted, and when the fire was out some of the creatures played night games. It was a wonderful time with Dan and his daughter, Danielle, and the rest of the crew. We said our good byes since they planned on leaving at 6am this morning, and retired our tired bodies. This morning when I awoke I began prepping the boat to leave, and before long others other joined me as well, and it didn’t take much time before we were raising the main, setting the fishing lines and pointed in the right direction. Chad and Marci are becoming quite the skippers. 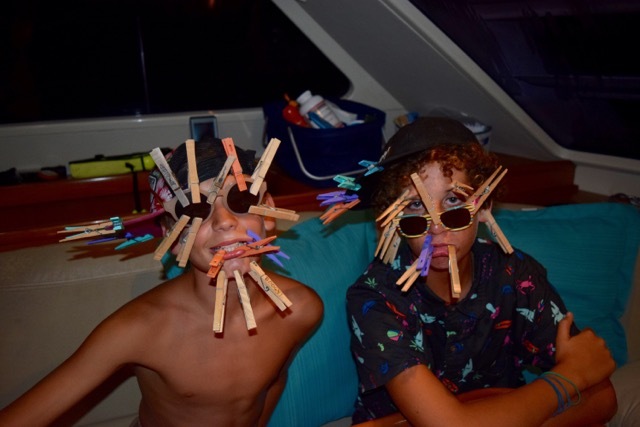 They know the routines at this point and are so much help and fun on the boat. As soon as we are underway, Glade falls asleep. He seems to be lulled by the motion of the ocean. A short ways into our sail the auto pilot stopped working for some reason, so we had to take turns manually manning the helm. It is good practice and it helps you appreciate the auto pilot much more. Marci has used her ninja nursing skills several times now. The worst injury of all has been Sierras toe. She cut it on the swim step where it attaches to the boat, and sliced it down to the ligaments. 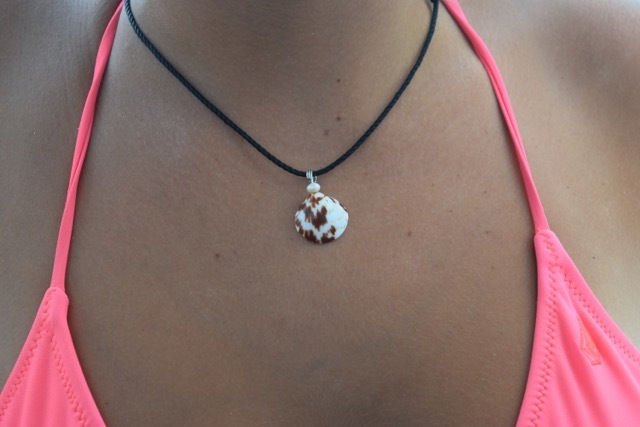 Mycah has been making the most beautiful necklaces from shells she finds on the beaches. She is planning on selling them. We are so excited because Danny will finally be coming home tomorrow, It seems like he’s been gone for a lot longer than two weeks. Yesterday we enjoyed a wonderful church service, then set out on what Marci called, a Sunday drive. The ocean seemed to be in a lazy Sunday sort of mood too, as calm cool water stretched out ahead of us and slow, beautiful, billowy clouds lay about in the sky. We worked out way south east back behind Devil’s Cay and off to the south west spotted a picturesque little beach which seemed to beg to be explored. The coconut palms that proudly stood had tiny fruit growing on them and a few lawn chairs were scattered about close to a pile of gathered firewood. Apparently we weren’t the only ones who admired this beautiful little island. Prints from crab tracks meandered all about as if they too, had their own bonfire. We bid our little island farewell and once again continued on through windex colored waters. We came across a small lonely dock and got out to explore, and found that it seemed to be abandoned with clothing, water toys and lawn chairs all about, but the mosquitoes had not abandoned it! It didn’t take long for everyone to launch themselves into the water. They spent time blowing bubble rings under the dock. 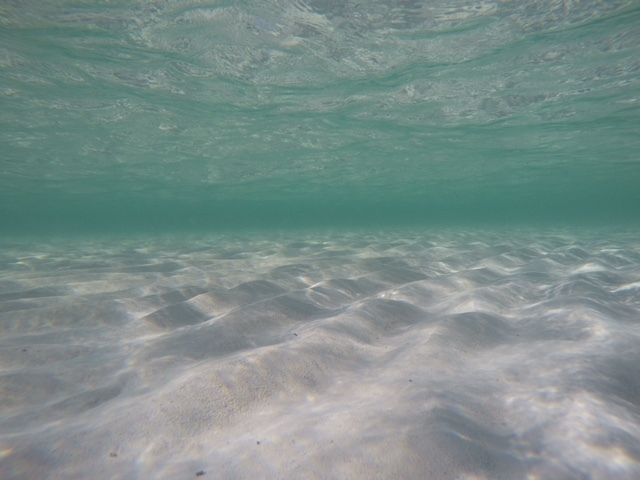 We took off again and came across a large area of sand bottom and beautiful blue, and some of us bailed out of the dinghy without saying a word. 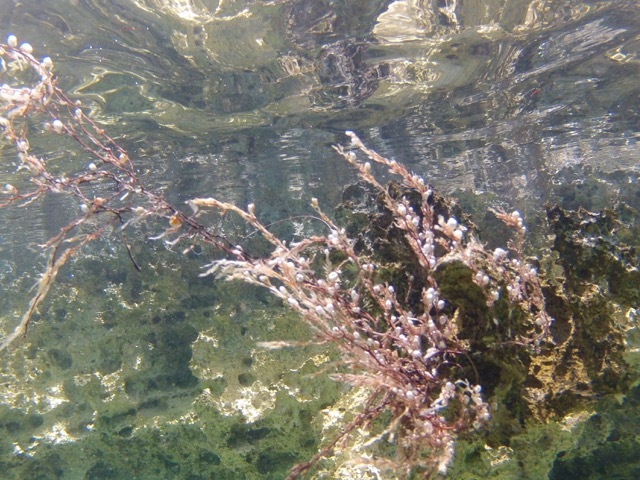 While snorkling about we came across what looked like pretty little pearls or bubbles attached to to sea weed. I’m certain they are some sort of egg sacks. So beautiful! We anchored the dinghy in the 5 ft of water and swam over to yet another beach which was also completely deserted. I was the first to set my feet on the sand and hesitated at first, not wanting to interrupt the perfectly smooth landscape. After returning to Tanda Malaika, Glade and Aidan decided to try make ice cream using the ice that Marci had removed from the freezer while defrosting it. They placed their concoction in the ice cream ball and tossed it about on the tramp. It never did set up but they all drank the mixture down and enjoyed it anyway. We’ll get some ice in Nassau and try again. We have ordered a small ice maker for the boat, which will be a great addition – more for ice cream making than anything else! You know your creatures are sailors when they set up a sun shade and use the winches and slip knots to secure it! 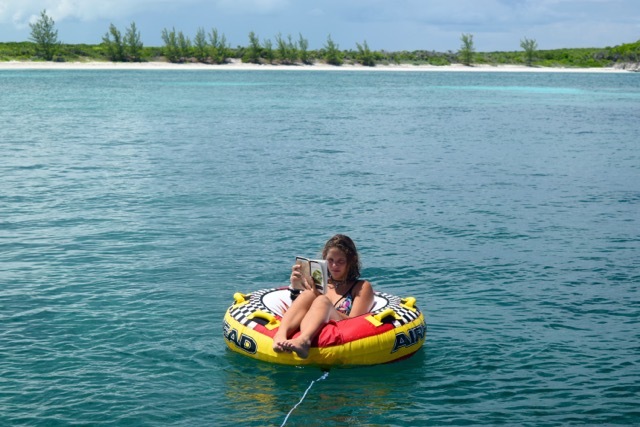 Jude captured a photo of Emma, who was engrossed in “Of Mice and Men.” She found herself a quiet place to relax and read. and then as the sun set the heavens were breathtaking in every direction. 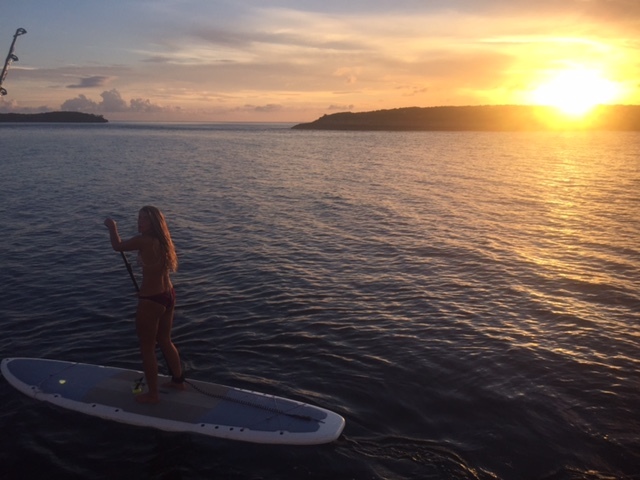 Jude boarded one of the paddle boards and moved out into the setting sun. What a gorgeous end to an absolutely magnificent day. I love my life on the ocean and I love the peace it brings. Yesterday our main adventure involved showing the Nell’s the blue hole. 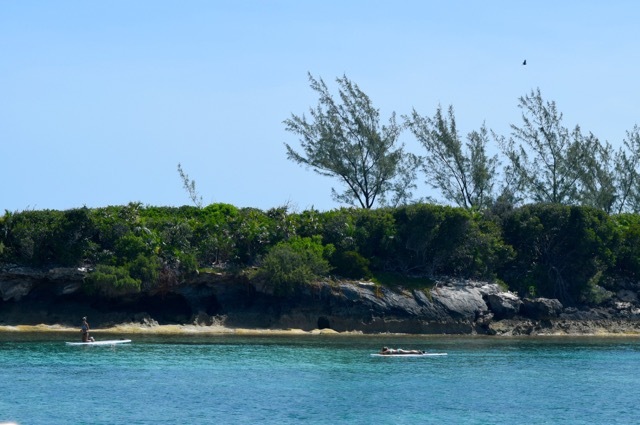 We all piled into the dinghy and over to the East side of Hoffmans Cay to the little beach where the trail head begins. While en route, the water was so clear and such an amazing blue. 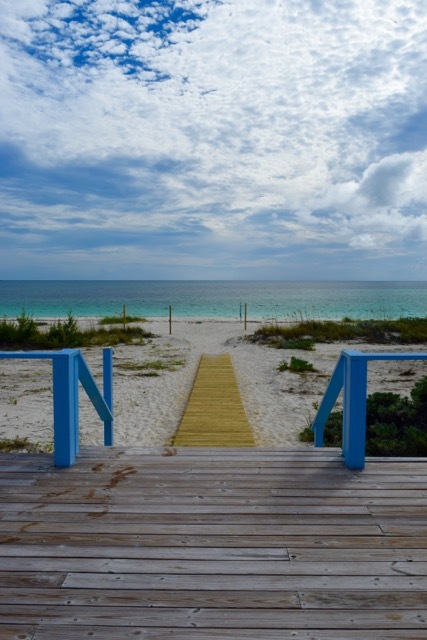 The beach is small with beautiful white sand, and the trail is well used and easy on the bare feet. In places the blue hole is up to 600ft deep and is fed by fresh water springs – causing the water to be brackish and random cold spots in the otherwise warm water catches one by surprise. It feels refreshing though! We jumped in and snorkeled around. Some of the side have large growths of green moss algae and others have heathy crops of clams holding fast. Small bait balls of tiny fish swim in perfect unison and upside down jellyfish lazily make their way in any direction that seems right at the time. The boys practiced doing backflips into the blue hole and we gave our bent delta anchor its final resting place. Chad was nice enough to carry it all the way up the trail for us. 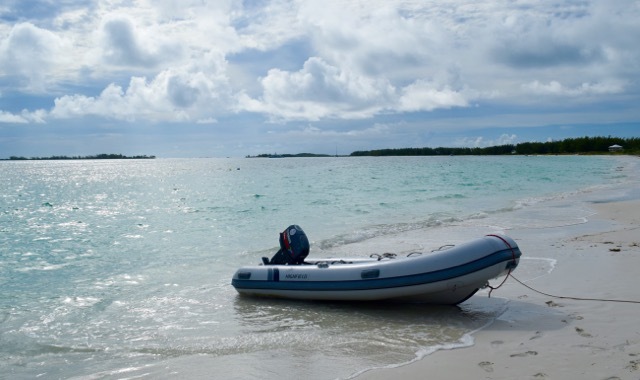 When we left there we explored over to the west side of Hoffmans Cay, and attempted to pull the dinghy up onto the beach but found that the waves were too big and were just going to fill the dinghy up. Emma and Jude took it like ninja navy seals to anchor it out a little ways. The beach was beautiful and Chad decided he’d attempt hiking up and over to the other side but found the foliage to be too dense and sharp to navigate through. We snorkeled around, saw many lobster including one that was SO HUGE! Yesterday morning before we left Great Harbor Cay, Marci, Jude, Mycah and I set out to find a store for some produce. We drove the family car to the beach and pulled it up onto the sand in front of a place called The Beach Club. The view from there is quite picturesque. We walked out to the road and listened to the cicadas as we walked. As a van approached I stuck my thumb out and a sweet guy with a crowded van that was barely running tried to see if he could give us a ride, but we thanked him and told him to go on. We could see we wouldn’t fit, and weren’t sure his van would make it much farther. The second vehicle was a jeep with a single lady named Gwen, and she happily gave us a ride all the way to the grocery store. Though the shelves were fairly well stocked, their produce section wasn’t much at all. We did find some yucca, which is one of our favorites, and the best find of all was the Bahamian Ginger beer. We bought a case. Soon after beginning our hitch hike back, the woman who manages The Beach Club drove up and offered us a ride. When she heard we hadn’t found produce she took us to another store and waited out in her car for us. They had plenty of fruit, but it was ridiculously priced. Apples were $1.20 a piece, oranges 80 cents each, bananas $1.59 a pound. We picked up a couple things but decided that we didn’t need it that badly. 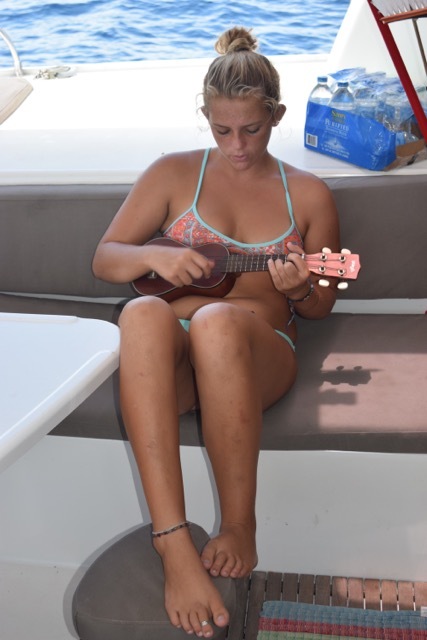 Our friend drove us back to the dinghy, we said our goodbyes and I asked her her name as I thanked her. At first I wondered if she was joking, but she was totally serious. Her name is Malester. So unfortunate. She is 50 and looks so young! We loaded in, pushed out and the girls went to start the dinghy with no success. After trying for a while we began rowing and Jude and Mycah switched off between the two of them for about 45 minutes. Periodically we would mess with the engine and still could not start it. Finally, Jude looked down and began laughing, realizing that we had forgotten to put the key in! We all felt like idiots and laughed at ourselves. 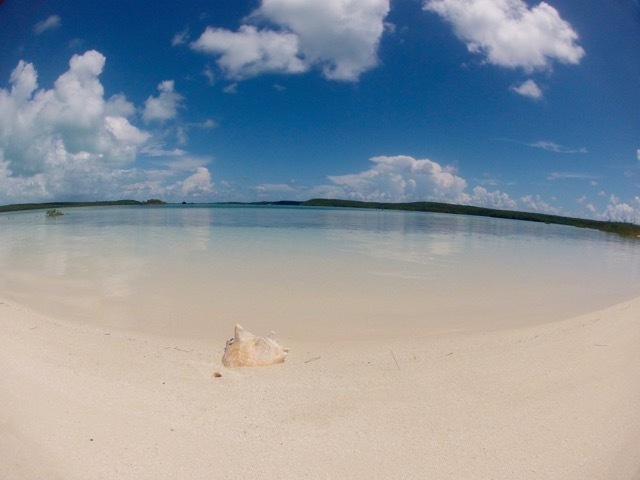 After reaching Tanda Malaika, we made our way to one of my favorite places on earth…Hoffmans Cay. 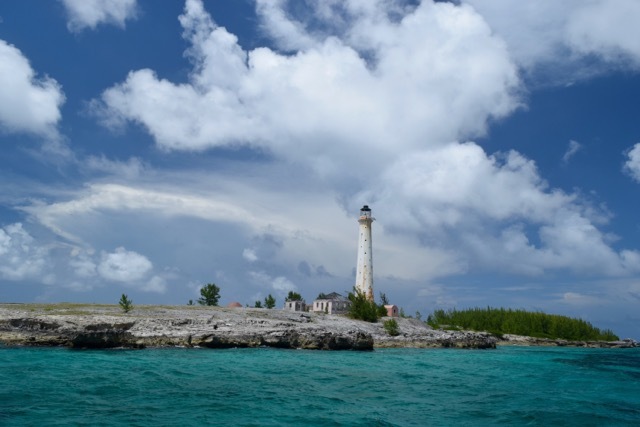 It is part of the Berry Islands and about 12 nautical miles from where we were. Aidan swung from the bosuns chair and then him and Glade rode in the sail bag. 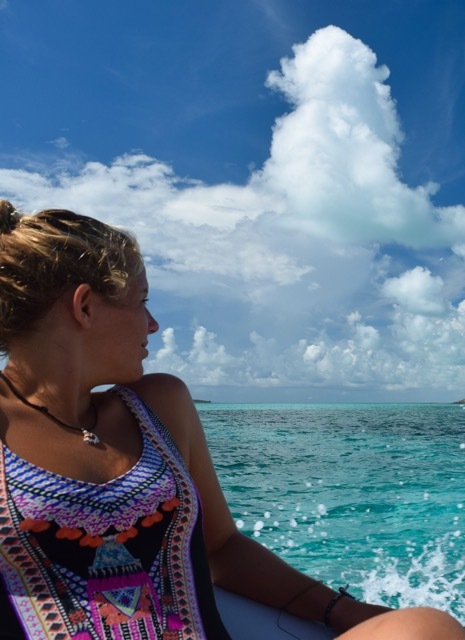 I had been talking to the Nell’s about how beautiful Hoffmans Cay is, and when we reached it they could clearly see why I love it so much. We could see a storm approaching but jumped in and swam around for a bit first, and explored one of the surrounding islands. What a heavenly place!!! After the lightening drew close enough we climbed back on board and closed things up. I checked the weather and it showed that the storm would bring 5” an hour. It really poured, and was so gorgeous. When it let up a bit we grilled kabobs on the braai and ate baked potatoes with them. Marci made the most delicious Banana Cream Eclaire Cake. Most everyone watched Dodgeball before bed. It’s been another wonderful day. Danny is a day closer to coming home and life’s good. This morning we woke up and immediately prepped Tanda Malaika to set sail. We stowed items we’d taken out while being at the dock, filled the water tanks, I mapped out our course for navigation, and we said our good byes to our wonderful friends. We have made new friends, and as always it’s tough saying ‘see you later’, but we realize that chances are we’ll cross paths once again – most likely when we least expect it. 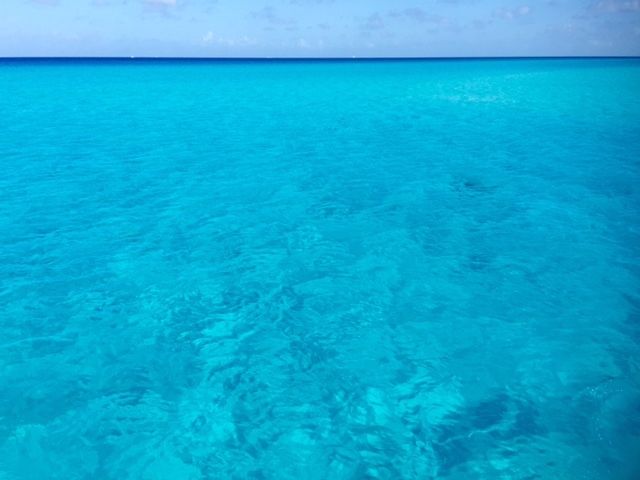 The color of the water as we exited Bimini was an endless blue of beauty. Just as we left Bimini, Chad set the fishing lines and announced that it’s going to be a good fishing day, and not long after that he caught a small fish and a lure. As the day progressed he caught 3 more fish – all barracuda, and one of them was humongous! Later Chad told me he hopes that all the barracuda aren’t going to gang up on him now…but we did set them free, so maybe not. 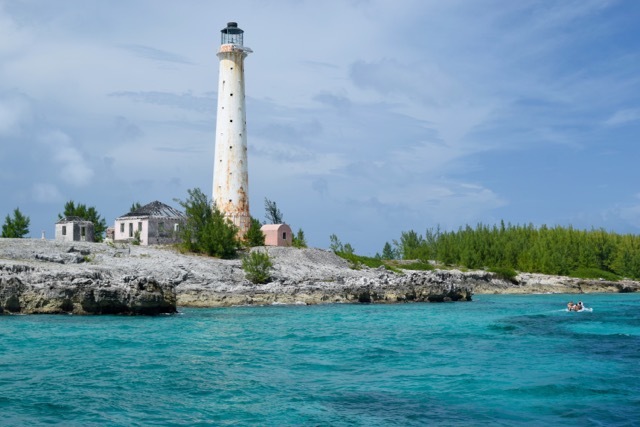 It’s about a 20 nautical mile sail from Bimini to Great Isaac Cay, where a tall 150ft eerie looking lighthouse stands proudly over the ocean. As I’ve mentioned before, people here believe that the island and lighthouse are haunted, and that a woman in a white dress is often heard wailing on the island. The caretakers of the lighthouse suspiciously disappeared in the 60’s and have never been found. 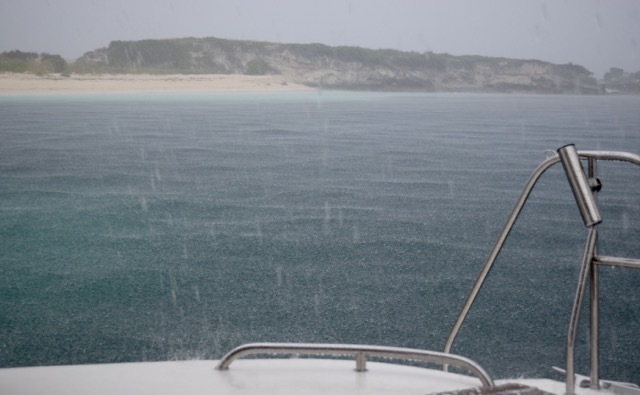 The creatures sat out on the bow as we approached Great Isaac Cay, some of them with worried looks on their faces. When we approached to anchor, the anchor absolutely would not set. Jude and Chad were at the anchor chain and could feel it moving along the bottom and then stop, the the boat would spin 180 degrees and the anchor would drag more. The boat would also not point into the wind as they do at anchor, but instead sat with her beam to the wind and waves. I finally dove in to see what was going on, and was surprised to feel a swift current moving east, and the wind was blowing west – which explained why the boat was sitting sideways. After several failed attempts at anchoring I told all the crew to raise the failing anchor then load into the dinghy and go ashore to explore, and I would man the boat. Once they reached land I watched them walk up the hill from the ocean to the buildings surrounding the lighthouse. Many birds circled in the air above the island, and I spotted large dark crabs making their way around the rocky ledges close to shore. They made their way clear to the top of the light house and shared these pictures with me. I decided to make good use of time and begin preparing dinner as I made my way back and forth between the helm and the galley. I put rice on to boil and prepared good old South African chicken coconut curry to serve over it. After a while I peaked out from the galley and saw them making their way back to me in the dinghy. They were all excited to tell me about their adventure. None of them heard any wailing! 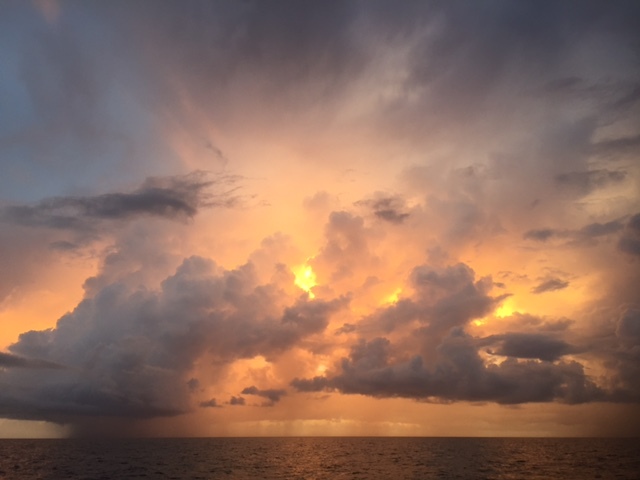 We continued on in the direction of the Berry Islands, which are 74 nm from Bimini. We knew we wouldn’t make it all the way today, and watched for a good place to anchor for the night. Just as the sun was setting we anchored in the middle of absolute nowhere in 22ft of water, over a large boomerang shaped sand patch. Tonight we will be gently rocked to sleep and then carry on to the Berry Islands tomorrow. This morning i woke at 6am and knew i should get out of bed and set sail since we still had 62 nm to go, but it took me half an hour to do it! 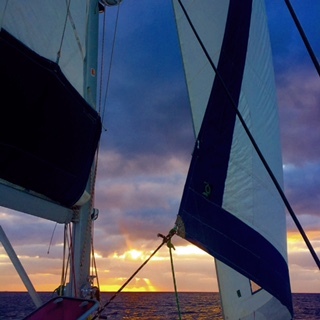 Chad, Jude, Mycah and Aidan helped raise the anchor as a gorgeous sunrise spread across the sky. 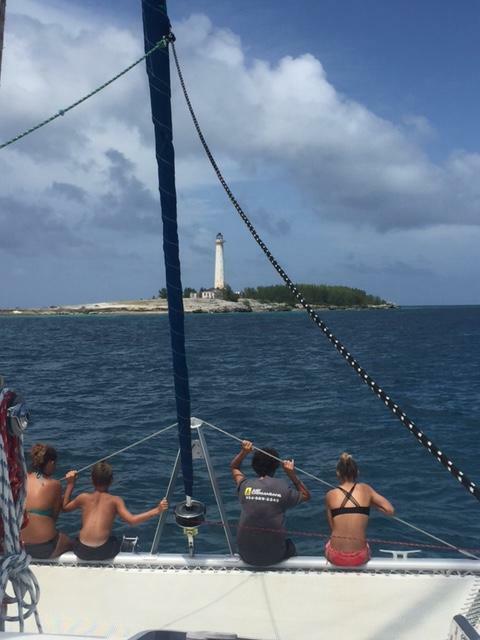 We pulled into Great Harbour Cay this afternoon after a beautiful sail, and set anchor in green water. A storm had come through and all the water from the waterway which is lined with mangroves that leads up into the island, has settled in the bay. It’ll clear up in a day or two. The creatures took off to explore while I called my Sweetheart who I haven’t been able to talk to for a day and a half. It was fun to catch up. Only about 1 more week till he returns. Chad and Marci went for a swim to shore and then a romantic stroll along the beach. 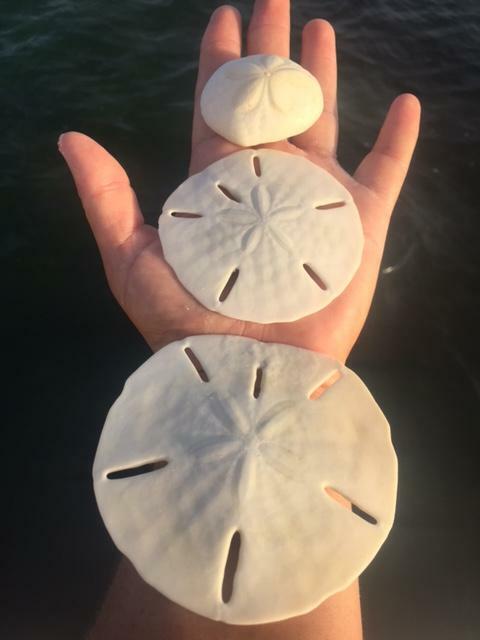 I swam and explored all around looking for sea life. Sierra gave me this photos to post…the water was clearer where they went exploring. When everyone returned we threw some chicken on the braai while the creatures sorted shells and began making some jewelry. They showed me this interesting find. 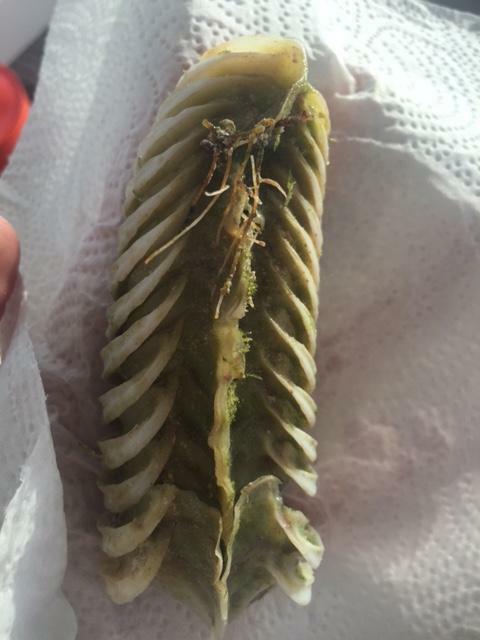 I messaged a friend of mine who knows far more about marine biology than I do, and we determined that it is most likely some sort of egg casing. 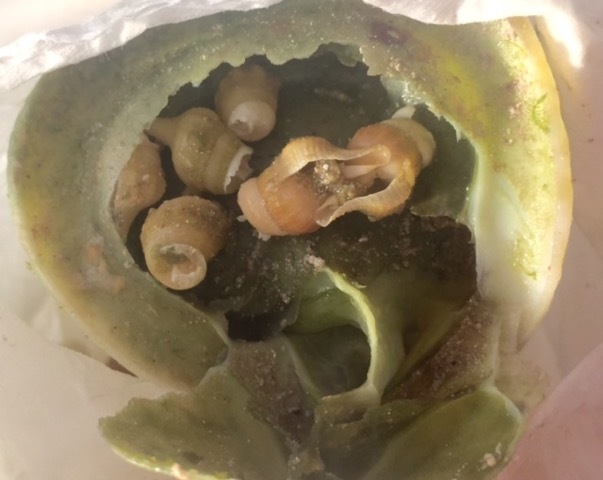 Inside each section is a layer of tiny shells. 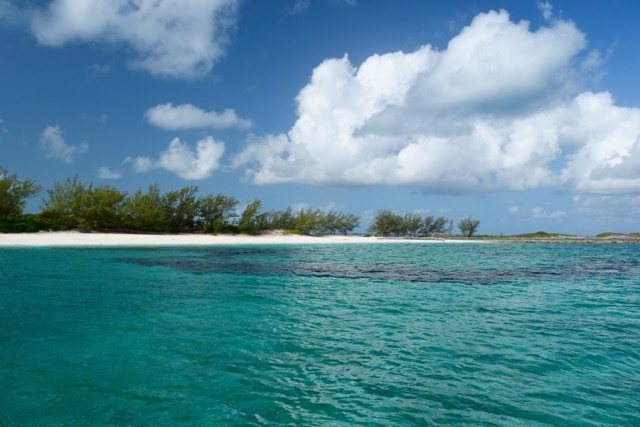 Tomorrow morning we will see if we can find a store for some fruit, then set sail for Hoffman’s Cay, which is one of my favorite places. Life is good and we LOVE having the Nell family with us!